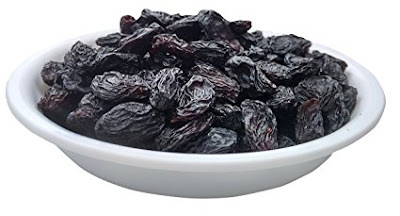 Black raisin is one type of medicine. It is beneficial in throat, stomach disease, anemia and weakness. It is warm. It is widely used in many medicine. Eyes: Soaked the black raisin in water for overnight. Chew it properly in the morning. This increases vision and avoids eye problem. Throat: Soaked 7-10 black raisin in water for overnight. Take soaked raisin in morning. This gives relief from throat infection. Do this remedy twice or thrice in a week. Blood: Soaked 7-12 black raisin in water for overnight. Chew the raisin in morning. This increases blood. It also cleans the blood. Immunity: Take 7-10 raisin with 2 figs and milk. This makes body strong and increase immunity. Gout: Black raisin has high amount of calcium. Therefore, it is the good source of bones and joint pain. This avoids gout and osteoporosis. Anemia: Black raisin contains iron, B complex and copper that avoids anemia.